I am a firm believer in baby carriers. 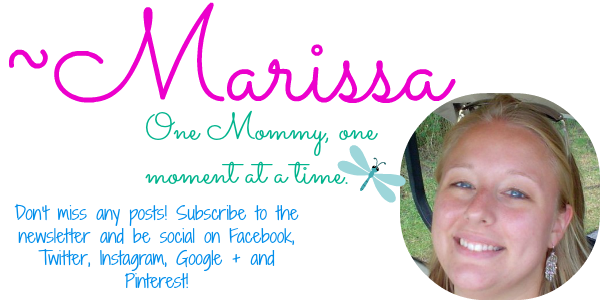 Not only do they provide ever important skin to skin contact between you and your baby, they also give you the ability to complete tasks while still holding your baby, or in my current case, toddler, hands free. 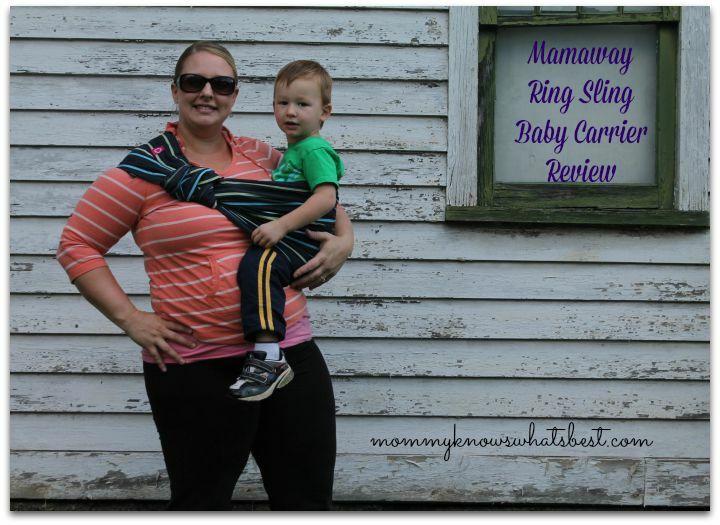 I was excited about this Mamaway Ring Sling Baby Carrier review. I have ring slings for summertime, but I wanted one that was a bit thicker for when the baby comes this winter! The Mamaway Ring Sling Baby Carrier is made from 100% Pima cotton. It’s breathable and allergy free, so there’s no need to worry about sweating while carrying the baby or either of you breaking out in a rash. It’s sensitive enough for a newborn baby’s sensitive skin. The rings are nylon rings and can hold up to 110 lbs of weight. Not that you’d ever need that when carrying a baby or toddler, but they are strong! 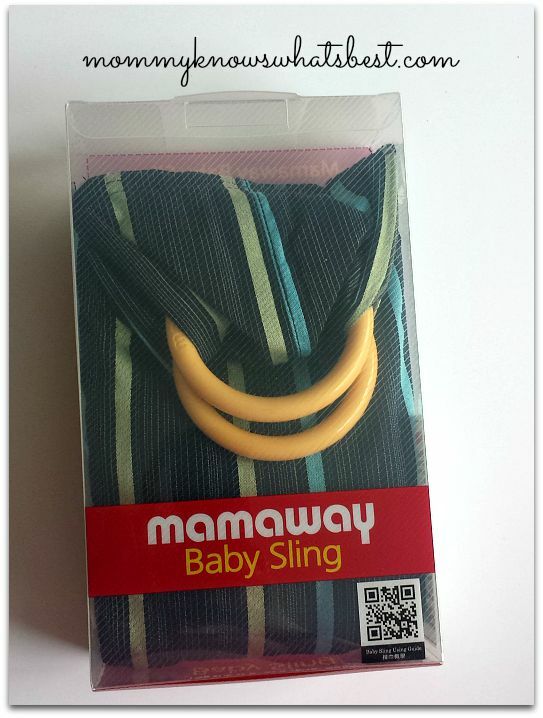 The Mamaway Ring Sling baby carrier can also be used while breastfeeding. It doubles as a nursing cover thanks to the abundance of breathable fabric. I like that it’s easily washable. To wash, you put it in a laundry bag and right in the washer, but hang to dry. It also can be folded up back into its built in pocket and stored easily. 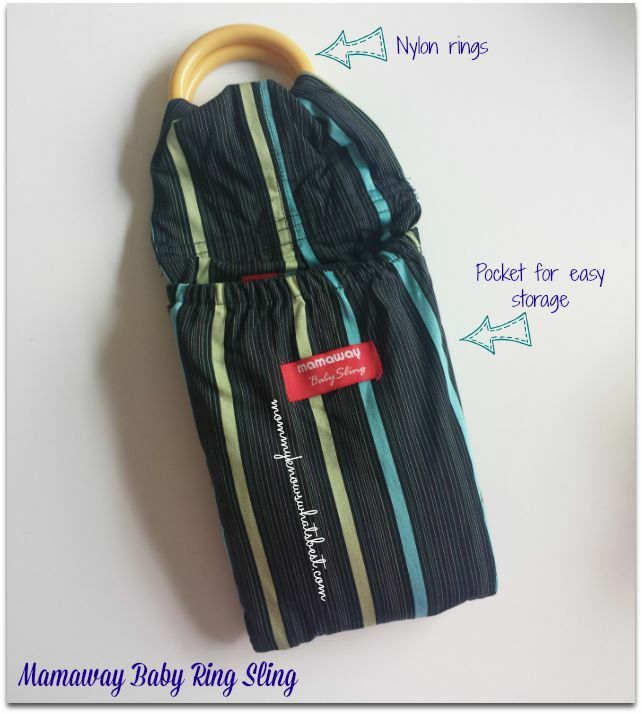 It fits in diaper bags and can be easily stored in your car for easy access when you’re out and about. Since the baby isn’t due for another couple of months, I use the sling with my two year old toddler on my hip. It’s definitely strong enough to carry him and takes the pressure off of my back and arms. I chose the Ocean Lanna pattern to review, and the colors are so pretty! The fabric is very strong, and the rings held onto the fabric without any slipping. I like the 1-2 inch hem around the fabric that gives it stability. I can carry my toddler around without having to constantly adjust the carrier, unless he fidgets too much of course. In this carry, the fabric is tucked under his bum up to his knees, and the fabric is spread widely across my shoulder and back. If he was sleepy, I could pull the fabric up around his back and he would keep his arms inside for a comfy carry. This sling is a lifesaver when the other kiddos need my help, and it was great to have on hand when I visited my older son’s school for Open House. No need to chase the toddler there! I tried this ring sling with my 9 month old nephew as well. He likes to be carried, and fell asleep within minutes of being in the sling! 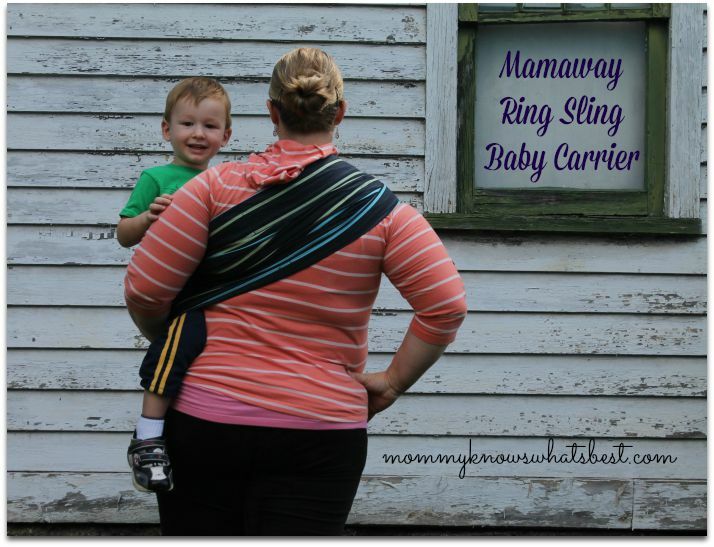 The Mamaway Ring Sling Baby Carrier is available on Amazon and comes in 11 different patterns. 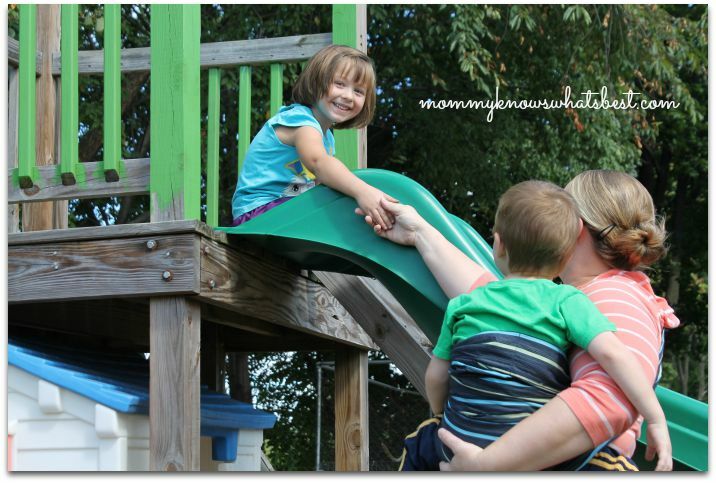 Have you tried a ring sling like this with your kiddos? What do you like or don’t like about them? I received this ring sling for free in exchange for my honest review. 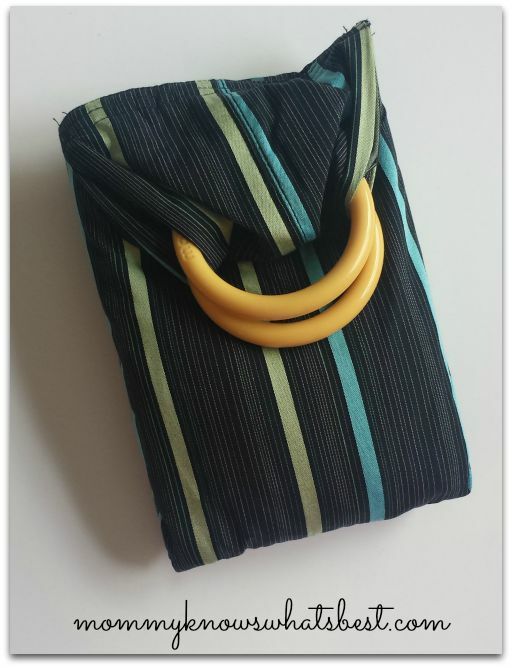 This sling was used and tested for 4 weeks before posting this review. All words and opinions are mine. Oooh I love the pocket for storage. 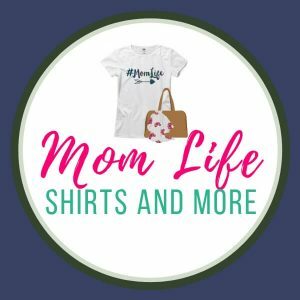 I’ve never been able to use a sling successfully with my 2 kids, but I love my Moby wrap! Ooooh!! A ring sling Ive never heard of!! And its gorgeous!! I love that its easily washable!! I am a little nervous over a nylon ring instead of a metal one, but I trust them! Looks like a really nice and sturdy baby carrier! I never had a sling for my daughters! This looks really easy and comfortable to wear!